Before we got to packing and painting a DIY project we've been working on we decided to walk around and explore. Well my friends there isn't much to explore.. but luckily for you I had my camera to take some shots of my casual outfit. It was so surprisingly warm on Saturday it felt like summer. I don't know whats wrong with Mother Nature and Alberta.. they obviously have a love/hate relationship because one day its beautiful and the next its raining and or snowing. Today looks like its going to be beautiful! yay! Yeah I love it too! I regret not buying it in different colours because it was so cheap! Beautiful sheer top, I love it! Oooh, these photos are amazing! Cute laidback look! 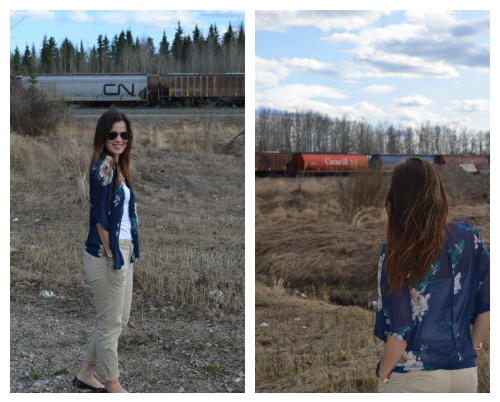 Loving your kimono top!